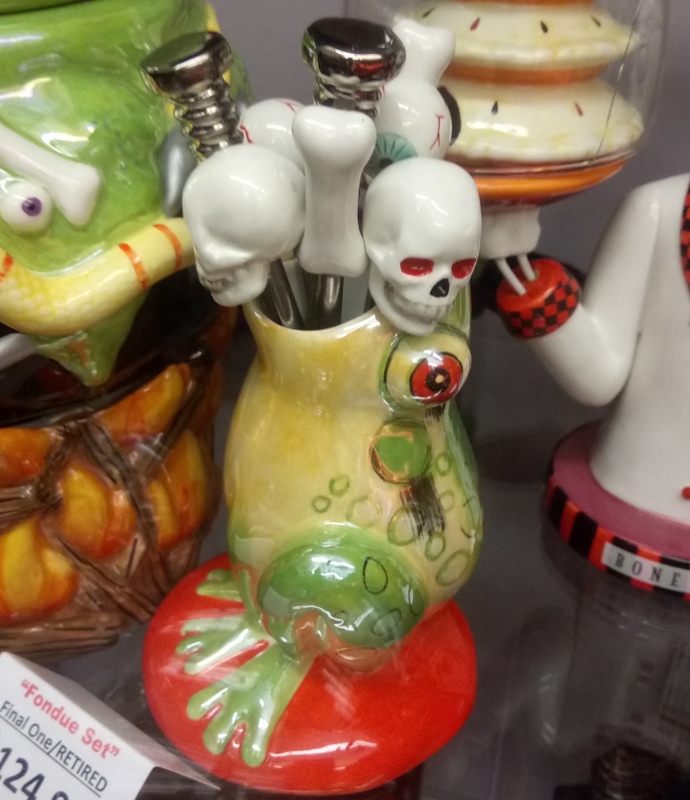 31 More Things From Ghoul Gallery! 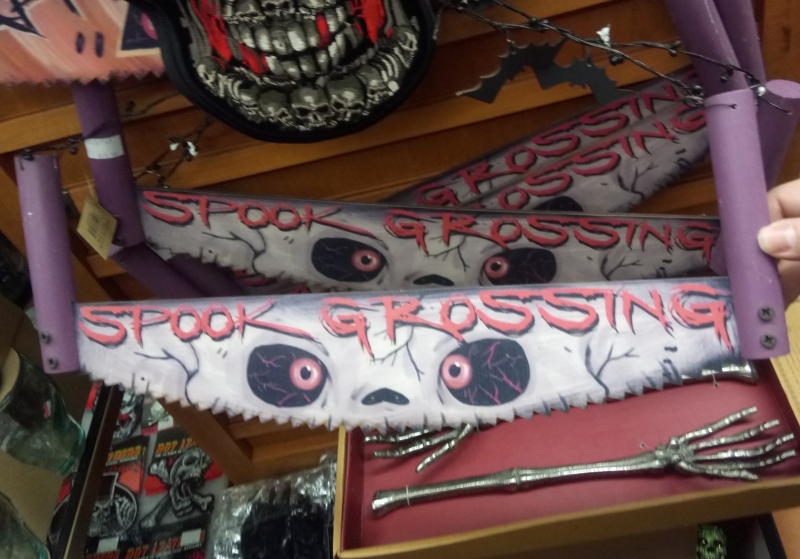 Located not all that far away from us in Oregon City, I reviewed Ghoul Gallery last year shortly after we moved to this coast, and it remains the single Most Halloween Halloween store I've encountered in all my years. It's even open all year round, with as much Halloween focus as usual, but I managed to hold off on revisiting it until at least September again. Just walking through this place is such a flawless, high-concentration Halloween experience that it only feels right to make a new seasonal tradition of it. This year, I even made an attempt to be a part of Ghoul Gallery's yearly Nightmare on Main Street as an art vendor, but the whole thing got rained out. 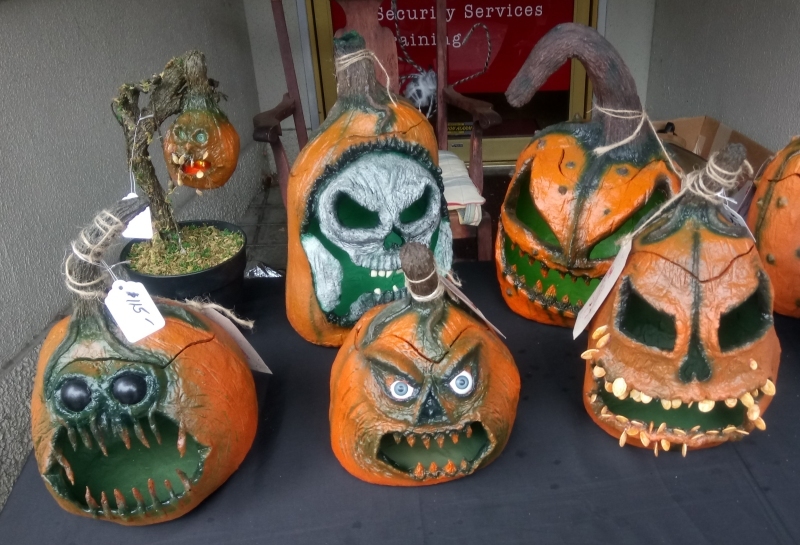 Surprisingly, native Oregonians aren't all that fond of walking around in the same cold wetness that partially clinched this area as my ideal living environment, even with promises of a scarecrow contest, hearse show, art sale, dancing witches and more. It was kind of heartbreaking to see their big plans fizzle out and said witches turn it in when their tent started blowing away, but I still had fun coming out, and there may always be next year. 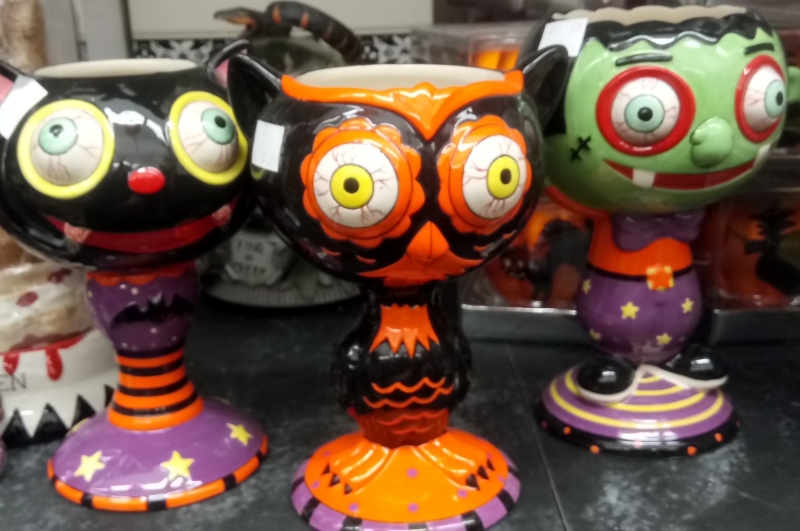 Until then, here's a seasonal 31 items that either weren't on the shelves last year, or I just plain missed them, because The Ghoul Gallery packs seriously that much Halloween into one space. I'm glad this little ornament says "GOBLIN" on its torso, or I might have mistaken it for anything from a gremlin to a ghoulie. The design has a great vintage feel to it, and I'm always a fan of character designs with round, legless weebl-bodies. 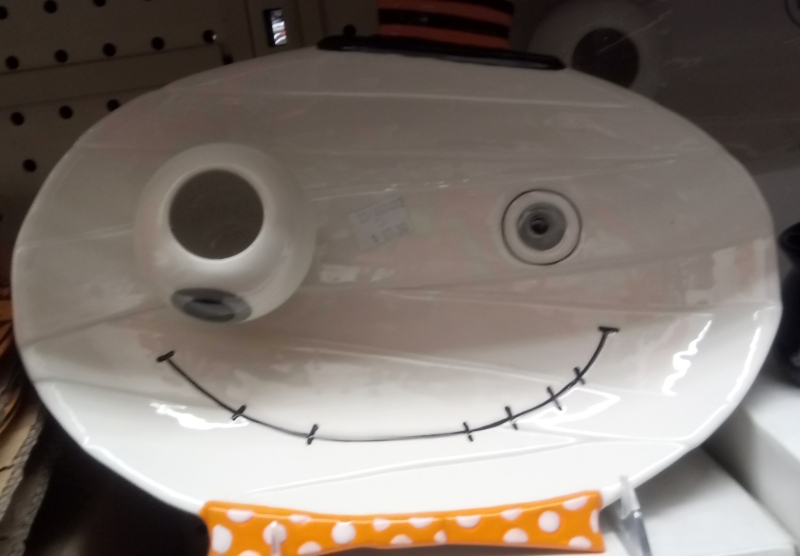 How cute as heck is it that this ghostly dish includes an oversized eyeball as a separate piece? I'm not sure exactly what you're supposed to do with said piece, mind you, maybe put toothpicks or something in it? I guess I neither throw nor attend enough parties to know my way around party dinnerware. 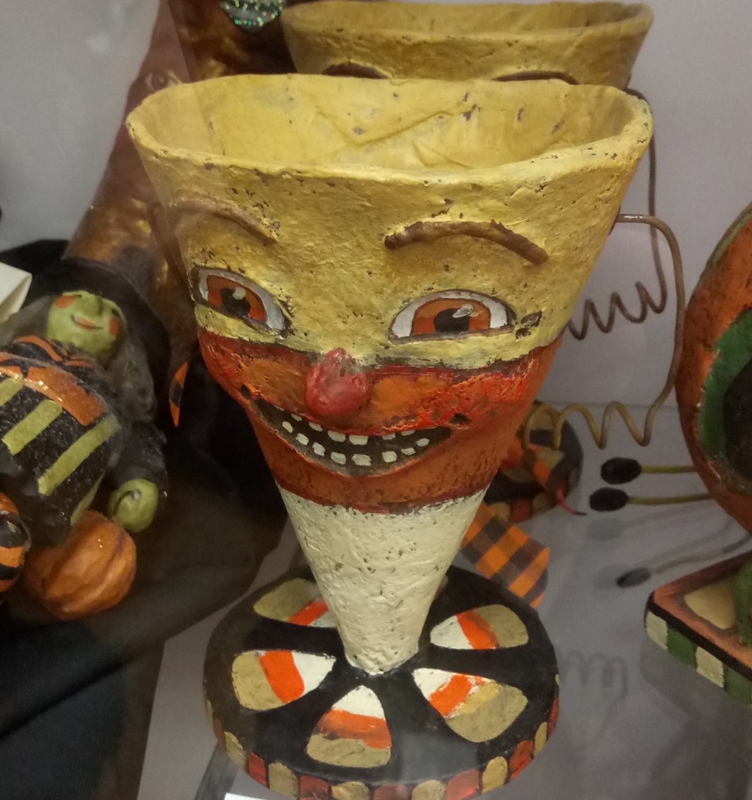 Purely decorative and not really usable as a pail, but that doesn't mean you can't put something in this Sugar Fiend's hollow top, such as actual candy corn, if you don't mind potentially staining an expensive, retired collectible with corn syrup. Isn't that probably exactly what this spirit would want? Look at his face. 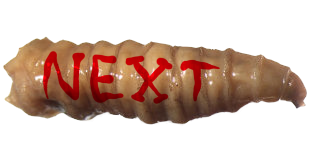 He can't wait for you to fill his cavity with the one and only thing he cares about. 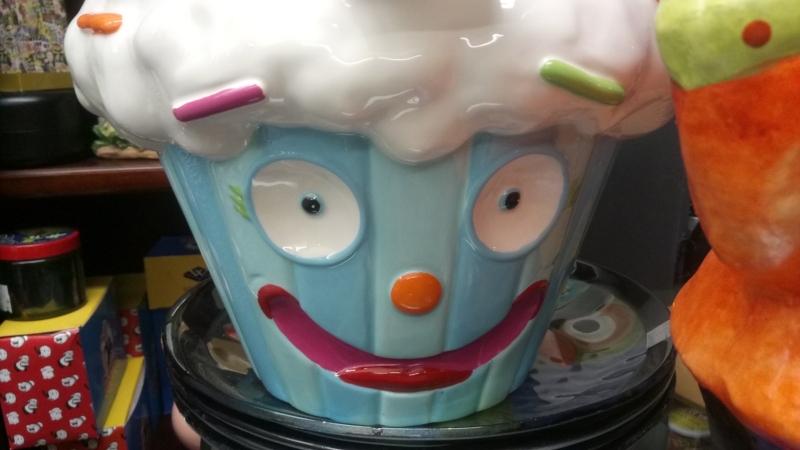 At least, I think this is for holding an actual cupcake? 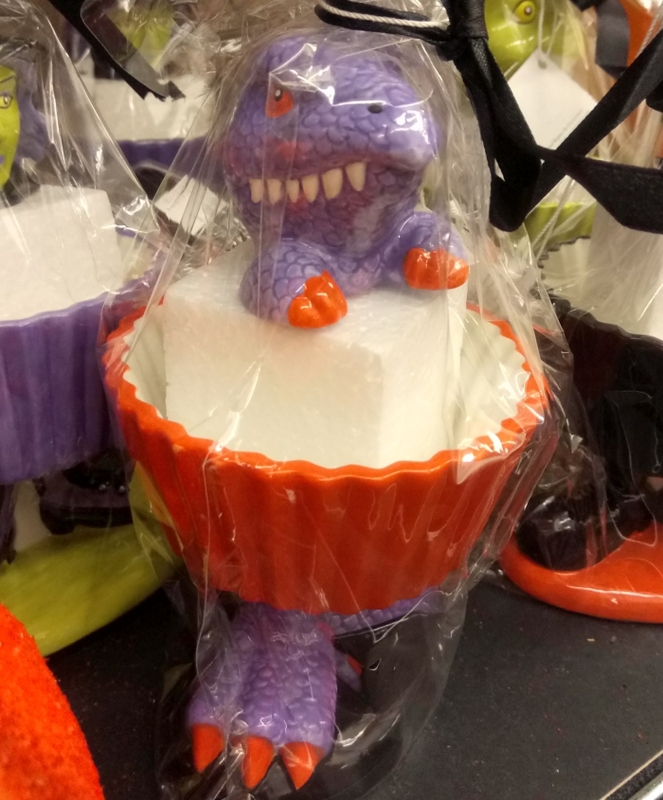 Whatever it does, this is one of the few times I've seen a nonavian dinosaur presented as a Halloweeny creature in itself, and there isn't any logical reason it shouldn't be. These are animals SO spooky, every single one of them are dead. 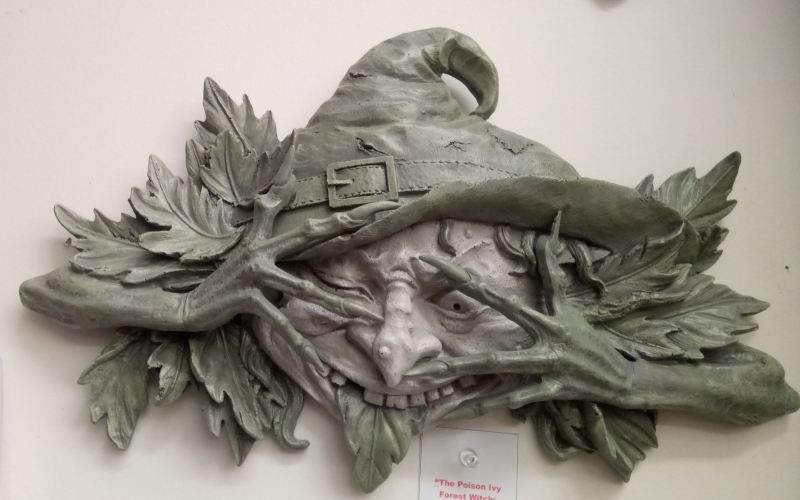 I just really love the hideous sneer on this witch. She is ecstatically hyped for a child to place their hands anywhere near her mouth. All three of these are darling, and Frankenstein's monster looks cooler than usual with those red-ringed peepers and Peter Lorre brows, but I'm most delighted by the owl. You don't see a lot of owls with veiny, awful, human-like eyeballs, and that single unnatural detail is enough to make it feel even more monstrous than the guy made out of corpse parts. In my excitement to photograph this spooky fondue frog, I neglected to get a photograph of the actual spooky fondue pot that goes with it. You can see part of it to the left, but come on, dig that frog! It's a perfectly normal frog, really, but it manages to look just a little more ghoulish than the real thing even without a bunch of magically shrunken human bones in its mouth. As the price tag indicated, this was the last of these fondue sets available, and if you want it, you'll have to not only fly over here to Oregon but shell out several hundred dollars. 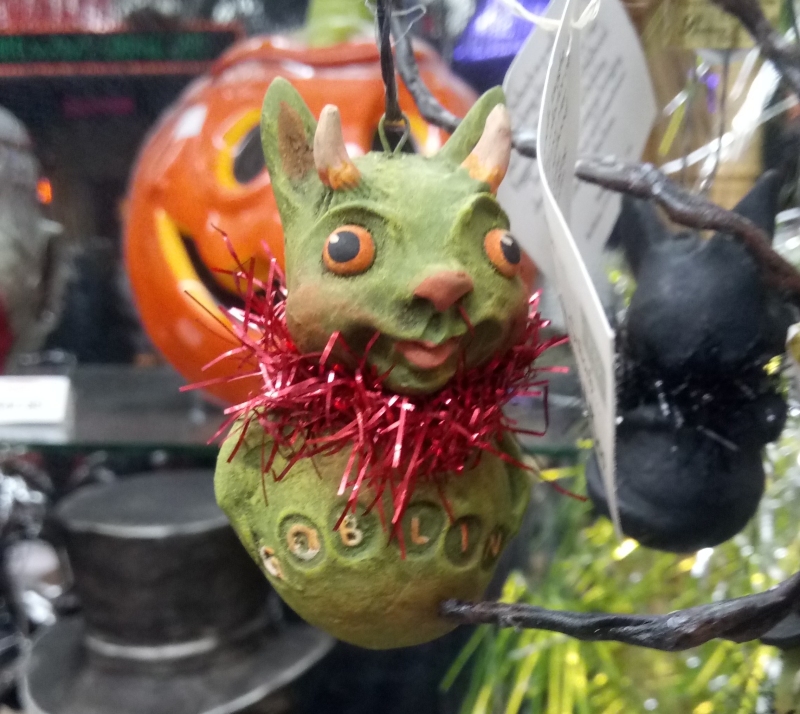 Another we finally covered in the Halloween Bestiary, these lovely junkins feature eyeballs not made of metal junk, so we have to assume they can do that if they want, and I'm especially pleased to see some with drills for noses. I somehow hadn't even thought of that myself, but it fits perfectly and makes them seem especially dangerous among their kind. 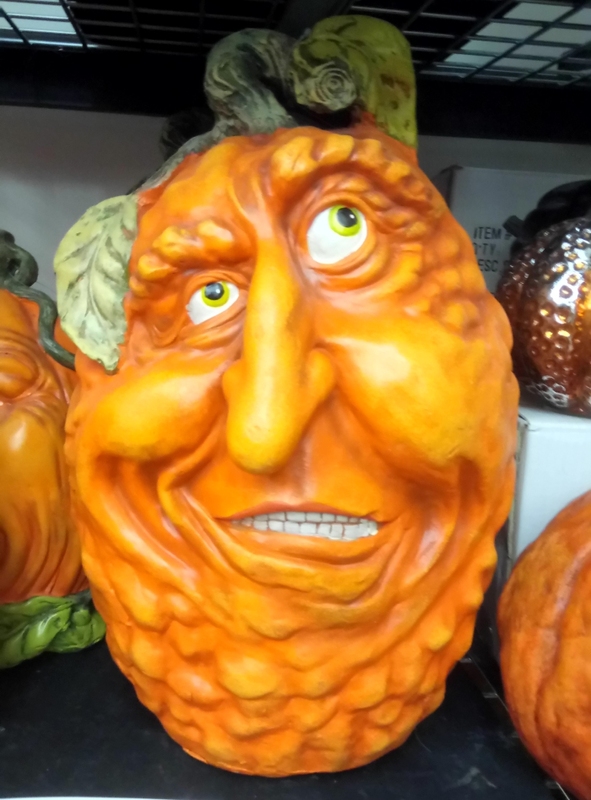 Pumpkins with completely human faces actually creep me out the most of all pumpkinkind. When I was a kid, they even sold ultra-realistic ones made out of soft, squishy foam rubber that became kind of a fad for a while. 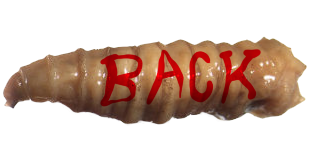 This is not a Halloween-exclusive item, but you can't stop Ghoul Gallery from treating it as one, and you can't stop me from doing the same. 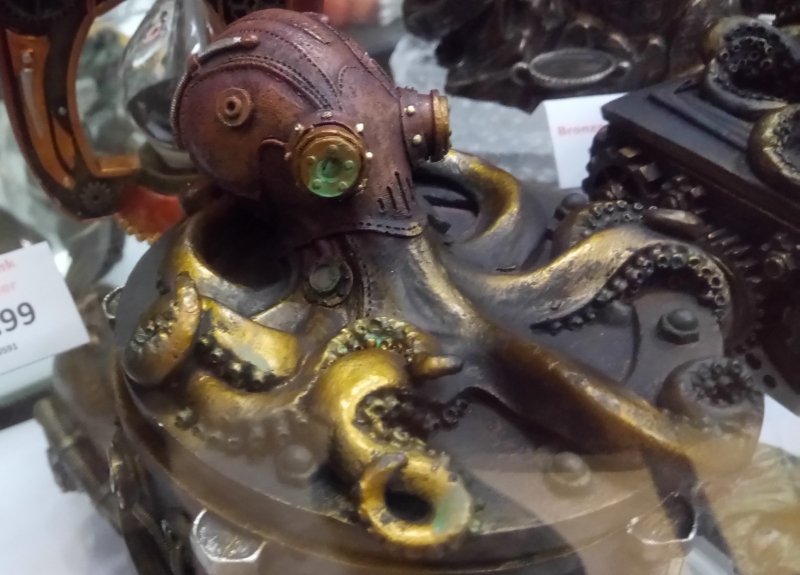 Octopuses should absolutely be considered Halloween creatures, and as Junkins have already demonstrated, even the well-worn Steampunk trend looks great in a spookular context. 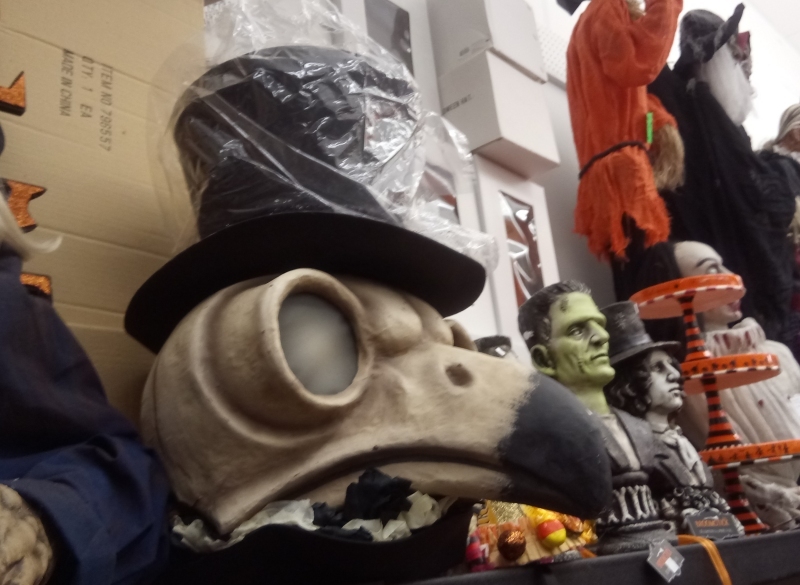 This is the exact same top-hat-wearing owl skull as seen on a smaller figurine I reviewed last year, but apparently they also made and sold enormous, disembodied head versions. 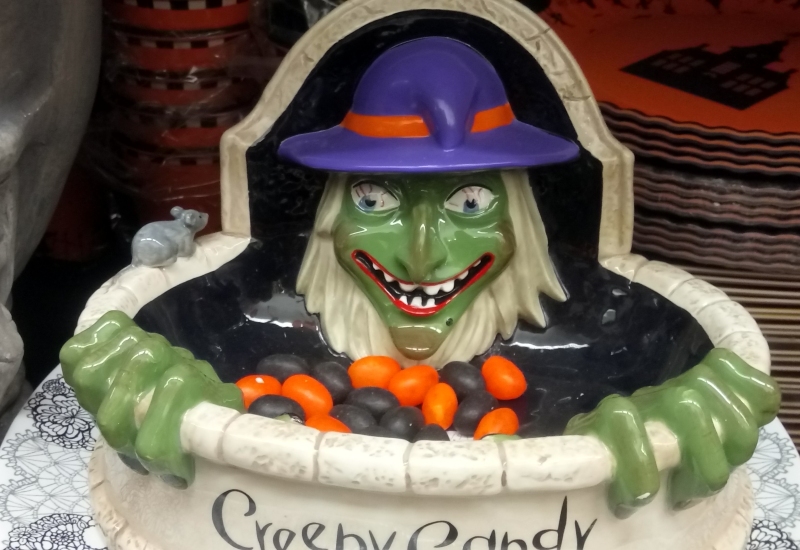 It's increasingly difficult for me to pick my favorite look for a candy-corn monster, but the simple addition of adorable black eye-holes and nubby arms to turn this kernel into a mournful phantom has got to be high up there. 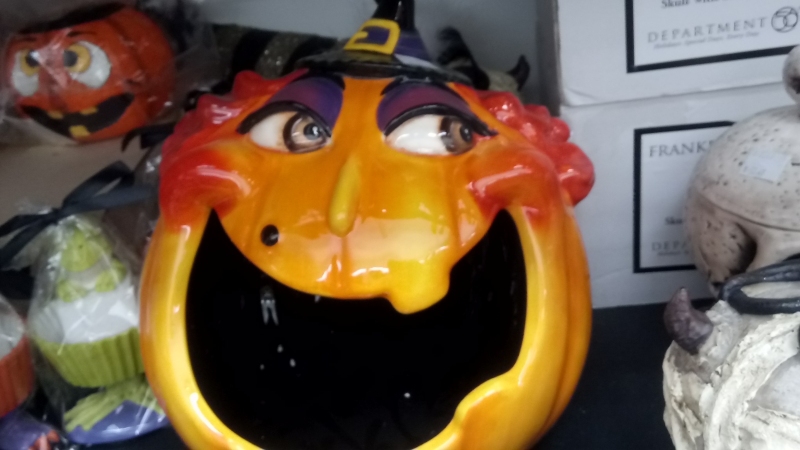 I've seen witchy pumpkins before, yes, but what I love about this one are what appear to be red "warts" of pumpkin flesh standing in for her "hair!" 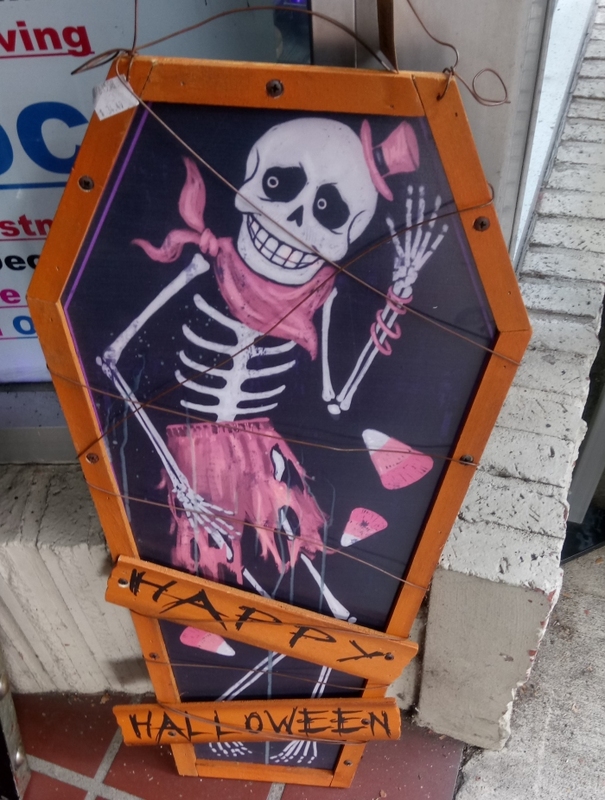 The cooler a skeleton is trying to be, the funnier and more lovable it is, unavoidably. I know everyone wants to pretend they're over Undertale just because its fandom was so big, but can we really call this phenomenon anything other than The Papyrus Paradox? Look at that absolute full with a top hat, a popped collar, sunglasses AND a knife in his mouth. 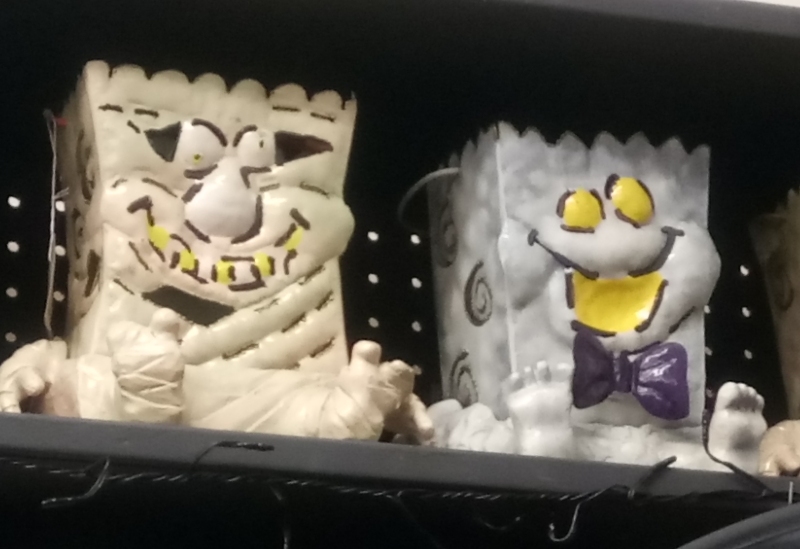 Speaking of Undertale, I see you there, Sans. I am BARELY reaching here. I really can't see any other face in this one. I don't know what he's so shy about, he is absolutely rocking that tattered pink ensemble and tiny hat. Every single day can't be Hoodie Weather you nerd. That's what I'm calling this, anyway, and again, there's nothing else I can see. 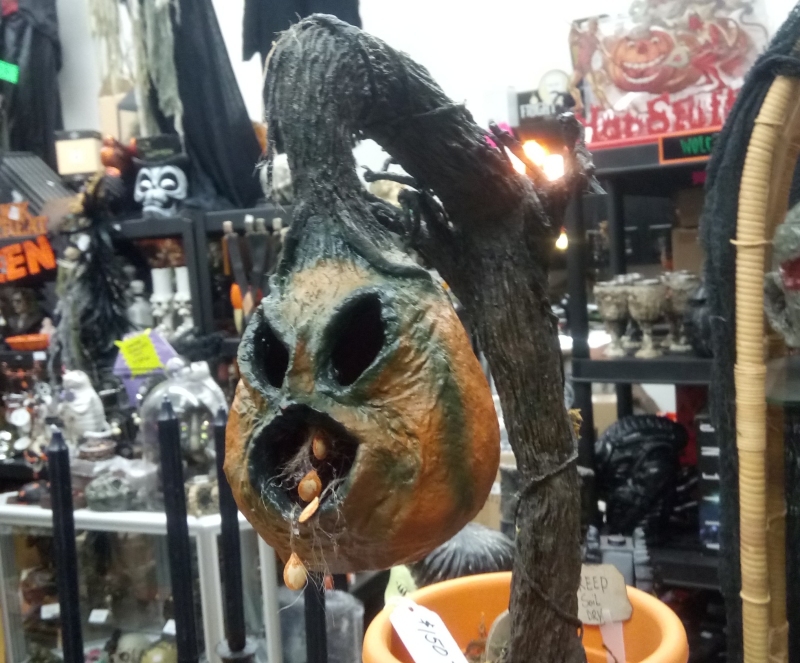 This pumpkin is CLEARLY in the process of decomposing and it's clearly channeling a goblinian personality. I can too easily see this design as a sniveling animatronic puppet character in some sort of 1980's Jim Henson production. Here's another, even snivelier specimen, and I wish my phone's camera hadn't set itself on "manual" for the millionth time instead of the crystal-clear "superior auto" setting. That's why a good half the pictures on this page aren't nearly as magnificent as they could have been. We saw some dolls by this same designer in last year's Ghoul Gallery post, which you can see by just plain changing the "17" in this article's URL to a 16, instead of me going through aaaaalllllll the painful arduous hassle of typing out one entire more link for you to click. 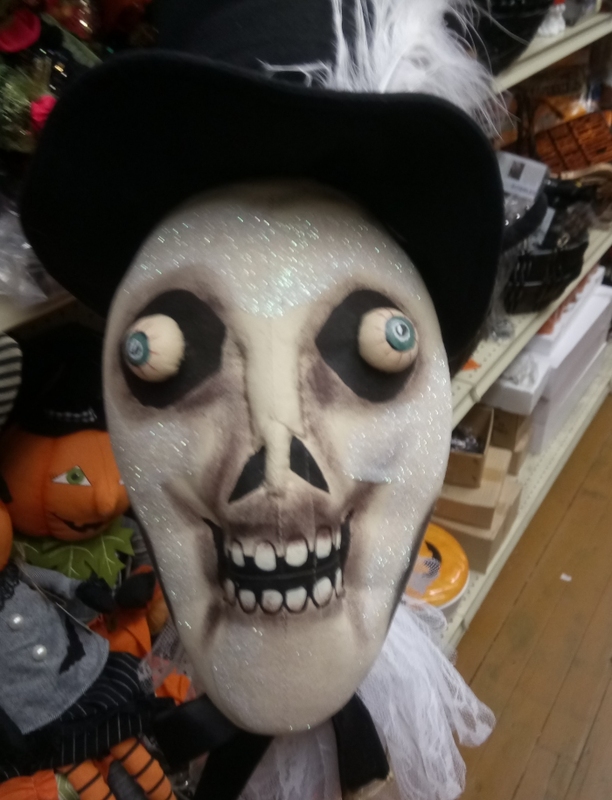 Anyway, this doll is nothing but this horrifying, rotten head on a stand, which is great. 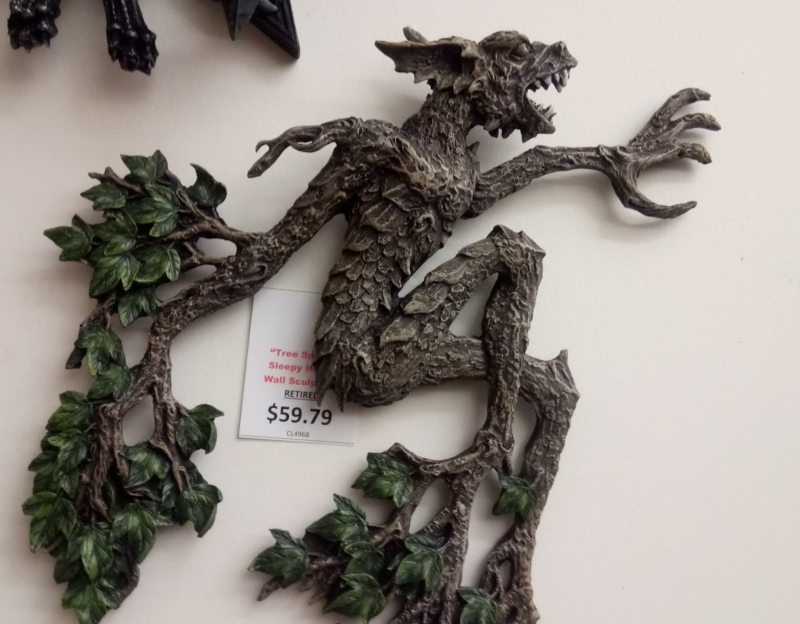 Speaking of gobliny thingabobs, this kickass botanical imp feels like a steal at only sixty bucks; inexpensive for this type of wall-hanging sculpture and for an item at Ghoul Gallery. I love how its legs and a single arm are fully leafy tree branches, or maybe it's currently in the process of shape-shifting between an ordinary shrub and a woody hobgob. This one is TOTALLY ripped from a Brian Froud painting, isn't it? If not, it's doing a bang-up job emulating his style, which isn't a bad thing at all. The sculpt is just positively gorgeous, especially with the fingers and hands molded separately from the face. This could have gotten away with being a much flatter, much simpler piece, but it went the extra mile to pop out at us. 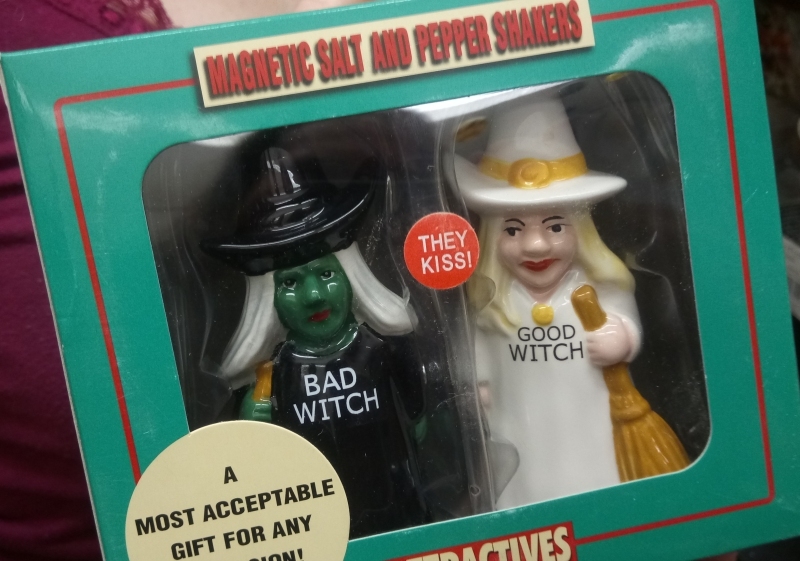 Unfortunately, it turns out that a magnet only holds these witches together side by side, so the sticker promising that "THEY KISS" might have been stuck there from some other, unrelated set of shakers. I will, however, fully accept the canon of whoever did so. 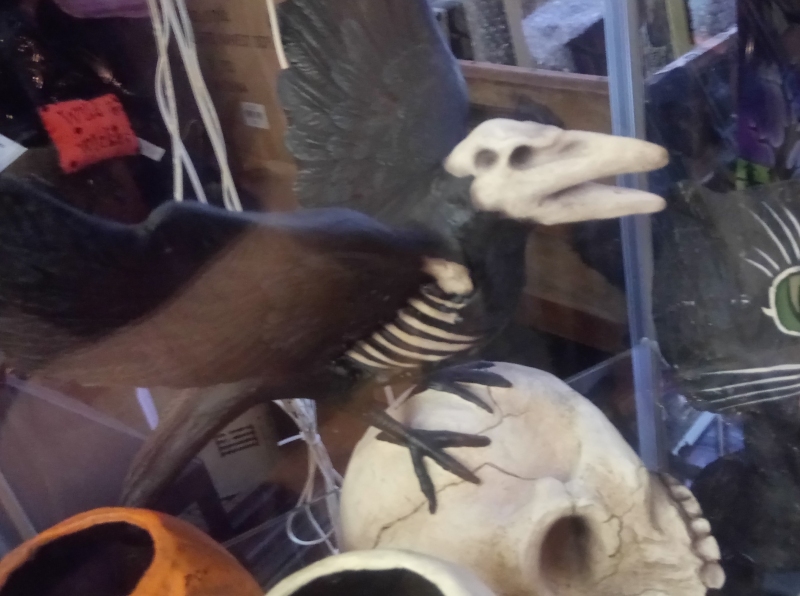 Okay, so this crow looks almost exactly like the cheaper half-skeletal crows I found at Party City in 2015, which is fascinating, because those crows looked entirely unlike an actual avian skeleton in such an oddly particular fashion that there has to be some "alpha" version of this specific mutant bird out there somewhere, maybe a particular sculptor who coincidentally designed both those cheap knick-knacks and this pricier resin piece, or maybe one is simply a pale imitation of the other? 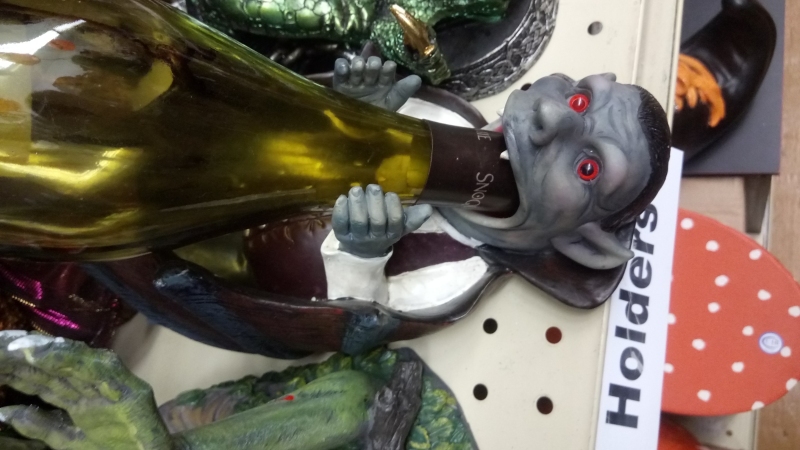 These bottle-drinking characters are always funny, but like I've said before, even funnier if you give them something other than a wine bottle. For a vampire, I'd have to go with a bottle of ketchup. 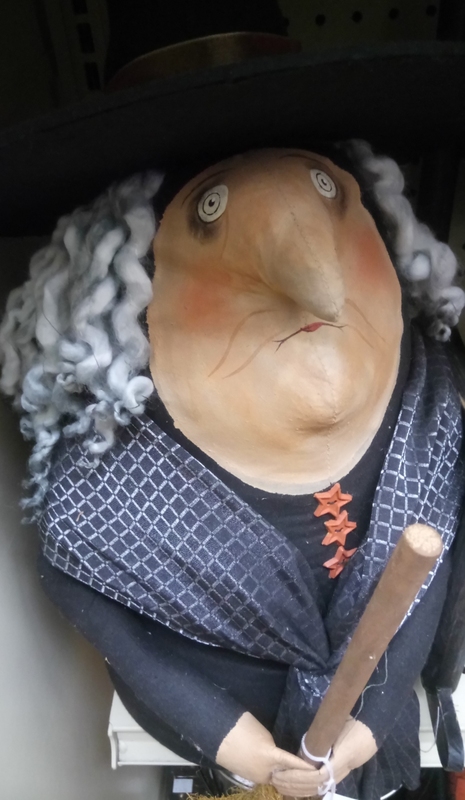 Definitely related to some other witches we've seen, like the spider-legged Esmerelda from Troutdale General Store the other week, only this witch is like 60% head with little, tiny eyes and a huge pointed beak of a nose. It's a great design, just inhuman enough to be interesting but not too over the top. Look at that sneer. 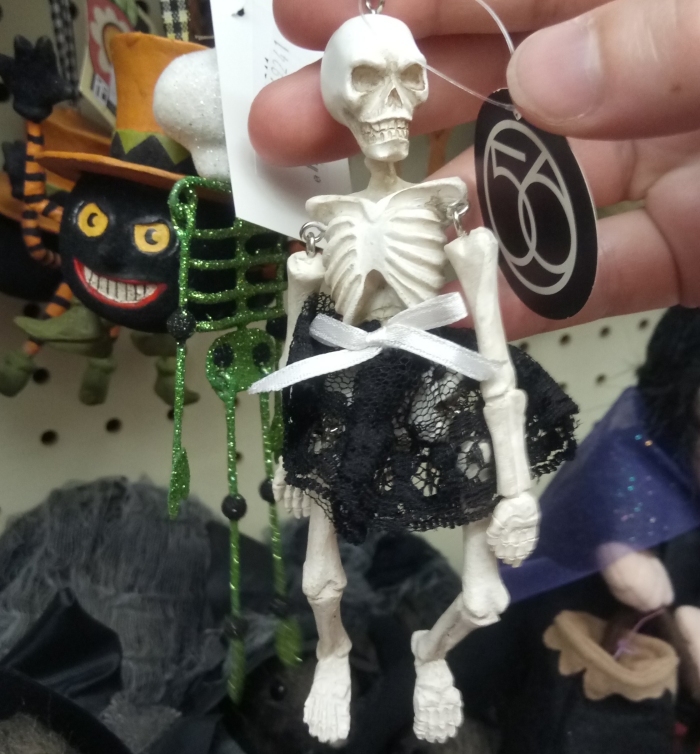 This skeleton is having absolutely none of your judgment for being wearing absolutely nothing other than a single, lacy black skirt. I don't know what exactly they're up to going out that way, but I'm sure it's going to be a whole lot of fun for all parties involved. 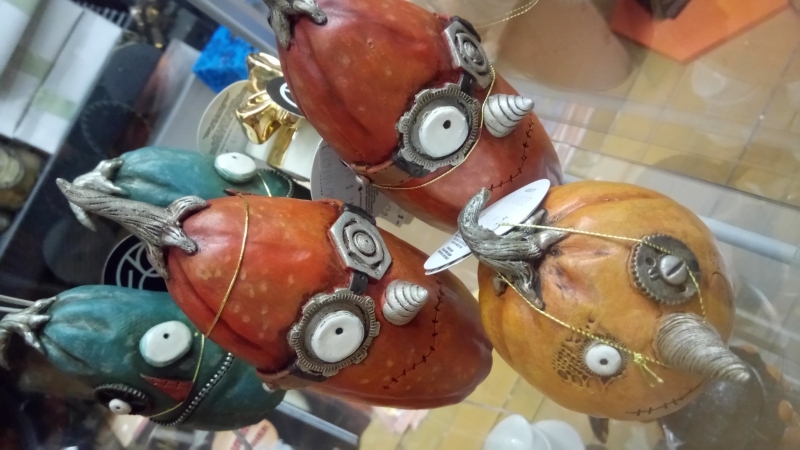 We've talked about the phenomenon of ceramic figurines who are also shaped like paper bags. Namely, we've talked about how it makes delightfully little sense whichever way you slice it. Like the Pokemon, Tropius, taking away any one of the elements here would result in something that makes far more sense, but just isn't a fraction as charming. 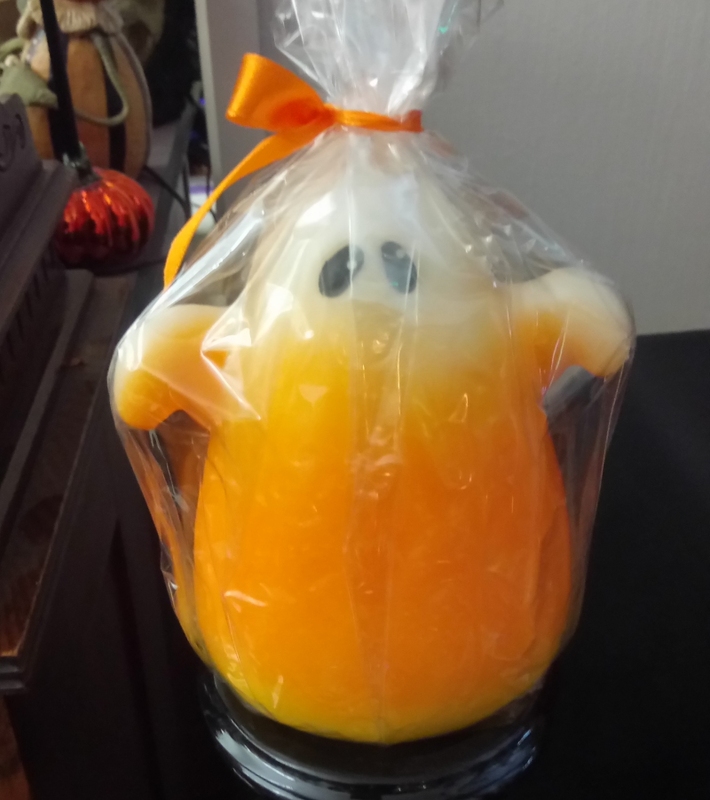 This is another one I'm not entirely sure is "really" a Halloween item, but that's a ghostly face whether they intended it or not, and we've very firmly established that all sentient confections are a category of spook. Welcome to Halloween, exceedingly happy cupcake! 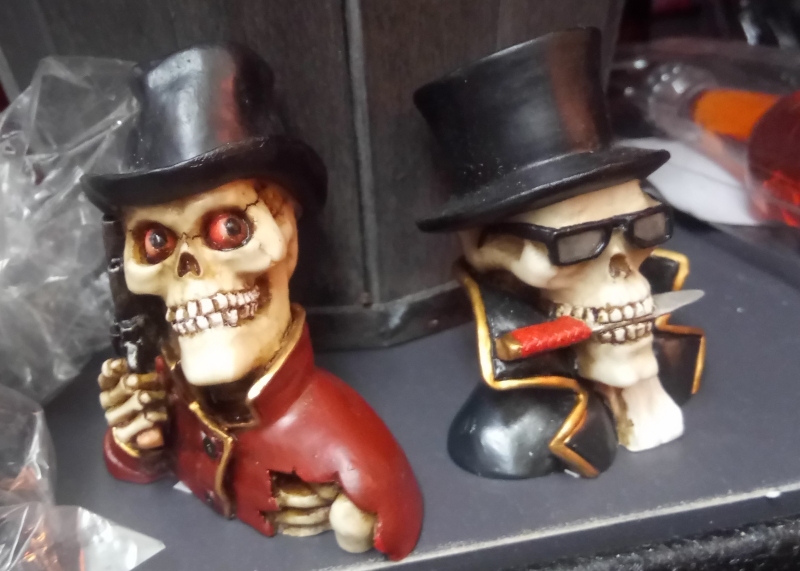 This is another salt and pepper shaker set, but the shakers are the heads alone, which are held in place by nothing more than very strong magnets. 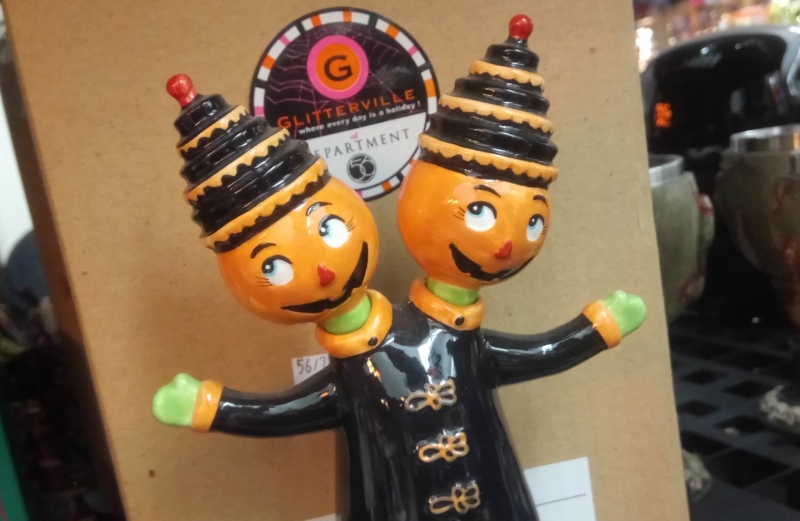 A fun, clever gimmick with a lovable design, and somehow one of the few pumpkin-people I've ever seen with two heads side-by-side. 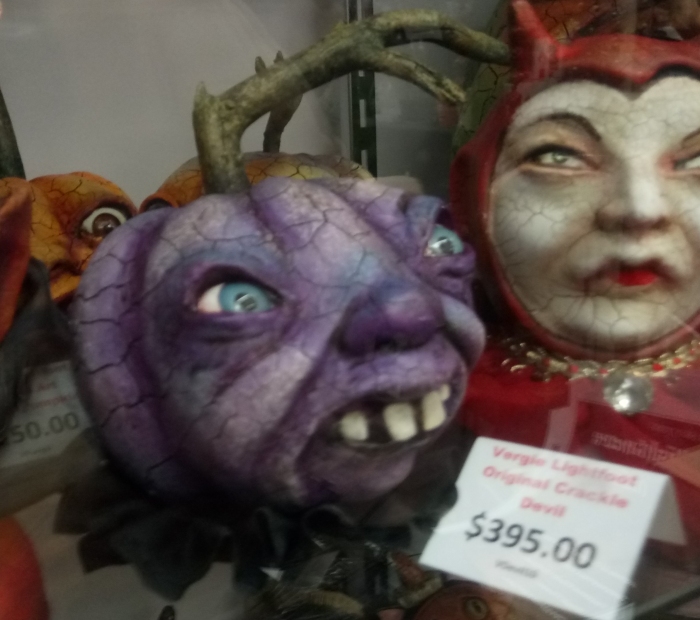 The artist behind this incredible one-of-a-kind sculptures sells almost exclusively through through Ghoul Gallery, and while I was impressed enough by last year's selection, they really do keep getting better and better. Check out the amazing mouth structure of the middle rear specimen, the anglerfish-like face on the left, and that excellent potted vine! 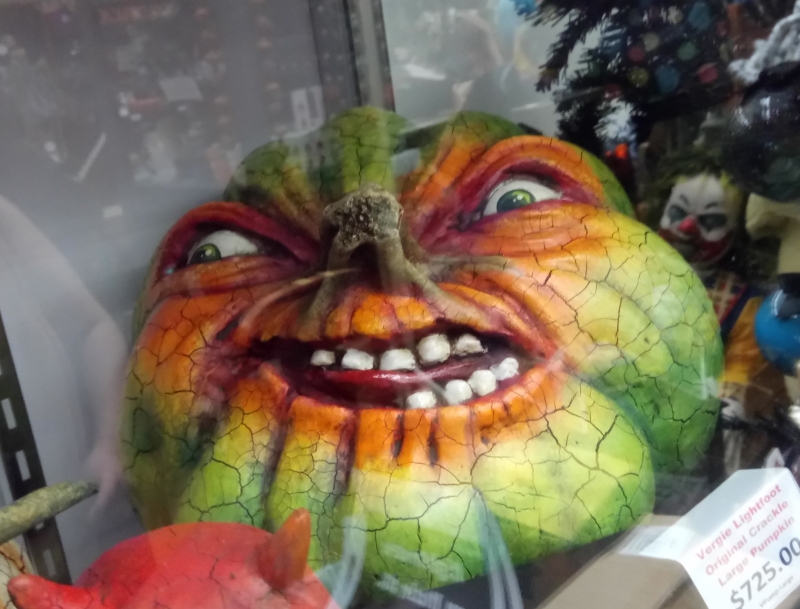 Another of the potted variety was for sale indoors, barfing pumpkin seeds that look a liiittle like they wouldn't stay attached forever, but it would still look gorgeously grotesque even without them! This is one thing I fell in love with and could actually afford to buy this year! A saw that's also a toothy skull face and a warning sign with a pun written in blood?! Sign me the HECK UP for some SPOOK GROSSING. You know our #1 rule, too: if it has any facial features, it's an actual monster. You cannot convince me these aren't living, skull-faced saw creatures we're looking at here. Last but not least and another one I went home with, I want you to really, really take some time to admire the design of this little tree ornament. 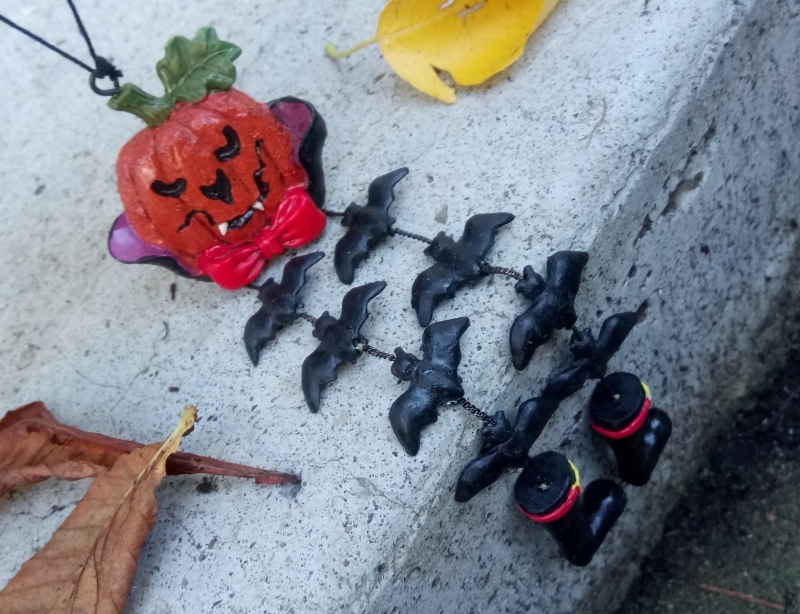 Really soak it in that this is not only a vampire pumpkin, but a vampire pumpkin with two giant, long legs somehow formed by a flock of disconnected bats and a pair of boots. How does THAT work?! Bats and boots just hover in place and it all somehow not only holds this pumpkin up, but allows him to locomote?! This is, I dare say, approaching Skilevak levels of magnificence. I think a demonstration is in order, too.